I hope someone can give me a bit of feedback. I added a white section to the scrubber because I do not know if the black leaf catcher (I do not know the right name for it) is usefull scrubber material. Currently a bit of cheato got stuck in the white section.. The distance between the led spot and the white scrubber section approximately 4 inches (lowest section 6.7 inch, upper section 2.8 inch). I hope to receive lots of feedback to ikprove the current setup. I do not know how much I will feed though. I am still in the process of maturing the reef tank it is up and running now for half a year apart from 2 clownfish and a few inverts there are not many animals to feed. I have a very similar set up in the back of my nanocube 28 and I am using a 5 watt grow light. I was thinking I might need a 10 watt but in the past few days it has really started to grow. I may be wrong but I was thinking the 21watt led was too much since they are so close proximity. The black material won't grow too well, because the holes are too big, and of course because it's black. But the white should do well. I really appreciate the replies. I wondered though how I should optimise conditions even more for growing algae. I currently have some cyano on the sandbed (and glass if i dont clean them for a week or so).. and I do not want a to get to the point where the cyano is taking over the tank. I am considering rubbing some algea from someone elses crubber onto the white canvas.. good idea? I fear the cyano will inhibit algae from growing as they compete for nutruints. About the 21w growspot, I also purchased another one maybe a bit overkill, but I also have 2x 15w growspots (those came alsready with the flexible holders) I chose for this set-up so I could play around with the distance & light intencity depending on my findings. I hope everybody here can help me out. All suggestions, hints & tips are very welcome. Kind regards from the Netherlands indeed. With a bit of luck green algae will grow naturally on the canvas, I hardly feed anything right now as I fear a red slime breakout, maybe someone can give me some advise as I do not want to starve the algae.. for now I hope there are enough pollutans in the tank to get some initail growth. No need to rub algae; it will grow on it's own. Cyano on the sand will go away quickly after your scrubber grows. Your screen is small enough for 1 light. However you could point the other light at the back side of the screen, once it starts growing. That is the answer I was hoping for, a waiting game it is. 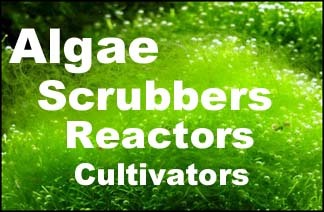 I will post an update on the scrubber as soon I notice any significant differences. Lights are now on 18 hours a day. I guess some slimy stuff will develop first, hope it all works out. I've been watching all of your videos and reading manuals for the scrubbers so I have an idea what to expect. Exiting! Today I received my second led light, unfortunately I noticed a difference between 2 identical leds lights i purchased. The second one turned out to be totally different the blue is much more bright and reds much less red.. I believe they forgot I requested 660nm and 455nm blue.. even worse.. when I tested the lights I nogiced the 21w had a totally different color! They were not red but orange! No wonder it wouldn't grow any algea... i hope i can get the right led lights. Yes I can imaging it is hard to special-build just one light. I sometimes have trouble ordering 100 of something. Well it seems that I am not getting my mony back, the chinese seller simply states they tested the wavelenght and that it is 660nm.. however.. it cannot be 660nm because it is orange. It is easy to see when looking into the light.. on the picture a bit harder to tell. I almost start to doubt myself as the seller does not admit his mistake.